As an active reservist with three tours of duty to his name, William Bruck has been a military man for his entire adult life. But in 2013, Will added a new line to his C.V.: home care franchise owner. Three years later, Will has become a passionate advocate for veterans’ home care and hopes more veterans will take advantage of the veteran franchise opportunities offered by the home care industry. Recently, Will spoke with Visiting Angels about where his journey started, where he sees his business going, and why he thinks the home care industry offers such strong veteran franchise opportunities. Will first enlisted in 1992, joining the army directly out of high school. He became an army reservist in 1998 and completed his undergraduate studies. Will then re-enlisted on September 9, 2001 — two days before the attacks that became a pivotal moment in our history. "That changed my life. Completely,” Bruck said. In the years that followed, Will made two combat tours to Iraq. After his second tour, he received the G.I. bill for the second time. With it, Will decided to pursue an MBA, enrolling at Columbia Southern University. During his time at Columbia Southern, Will decided he wanted to own his own business. He knew he wanted to open a franchise, and began to search for franchise models, including veteran franchise opportunities. But after a number of attempts, Will had only come up with dead ends. Only two months after reading that top veteran franchise opportunities list, Will opened the doors to Visiting Angels in Monroe County, Michigan. Will says it took only four weeks for him to decide to act on the franchise opportunity with Visiting Angels. “I started calling franchisees, and everybody was way too happy,” he recalls. Even more important, the Visiting Angels franchise model fit what he was looking for exactly in a veteran franchise opportunity. But there was a catch. Will was still an active reservist, and he’d been notified that he was returning to combat. In the end, Will hired someone full-time to run the business while he was gone. With the help of Visiting Angels’ corporate staff, he made it work. “They gave so much support while I was gone,” Will says. After his third tour of duty — this time in Afghanistan — Will returned to find the foundations he had laid had paid off. Business was thriving. It’s only continued to grow since then. Will’s agency now employs more than 50 caregivers and has given Will the financial independence he’d hoped for. But even more important than Will’s success is how his business has given back to Monroe County’s veterans. “Being a veteran, I noticed that almost every single person that was being taken care of by our company was a veteran or married to a veteran,” Will says. Will now has a contract with the Department of Veterans Affairs in his area, which is responsible for nearly half of his agency’s clientele. 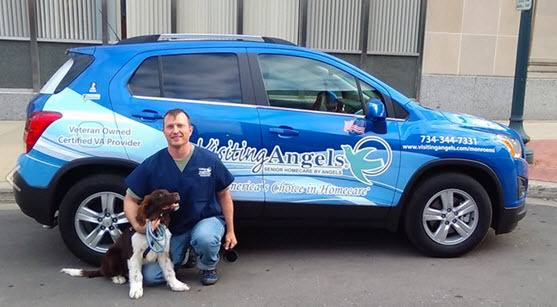 He has since worked with other Visiting Angels franchise owners teaching them how to connect with their local VA hospitals. Three years after researching the top veteran franchise opportunities in the Army Times, Will’s certain he made the right decision. When asked if he thinks other veterans should consider franchise opportunities with Visiting Angels, he doesn’t hesitate. To learn more about the veteran franchise opportunities offered by Visiting Angels, call 800-365-4189 or request information online.